COLLINGWOOD'S Jack Frost has nominated the Brisbane Lions as his new home, with the out-of-contract key defender set to sign a three-year deal with the Queensland club. 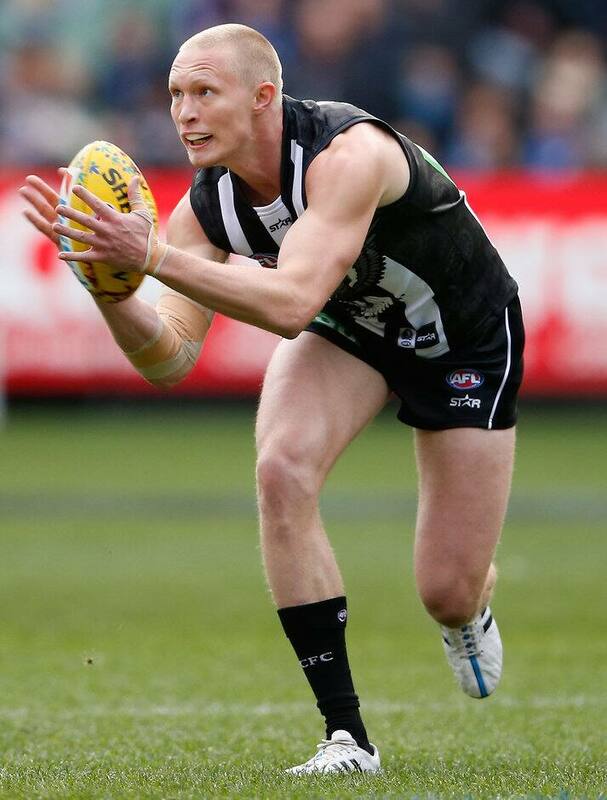 The athletic 195cm backman, who has played 54 games for the Magpies coming off the rookie list, fell out of favour this season and didn't play senior football after round 12. As forecast by AFL.com.au in September, Frost was on the Lions' radar as they looked to boost their defensive stocks. "Frosty has decided that's he's going to be joining the Brisbane Lions on a three-year deal, should a trade be done," his manager Ben Williams told NAB AFL Trade Radio. "Obviously players want to play footy and they want to play senior footy and he was out of the team and didn't look like he was getting back in the team." Frost, 24, is the first player to choose to join the Lions in the club's new era under freshly appointed coach Chris Fagan, although the groundwork for the deal was laid well before the ex-Hawthorn football manager took the reins. "He (Frost) obviously had some interest with some clubs and decided that Brisbane's the best place for him," Williams said. "Collingwood were very transparent all along and they wanted to keep chatting regarding Jack and they never made a formal offer and they said they may during the trade period. "But Jack obviously wanted something a bit more solid and obviously when a club makes a serious offer for you they have an intention to play you." Meanwhile, Williams expects Hawthorn key defender Kaiden Brand and Calrton veteran Sam Rowe to remain at their clubs next season. Brand, 22, made his Hawks debut in round seven and played 11 games this year, but was dropped for round 23 and overlooked in finals. Rowe appeared in every match for the Blues and the 28-year-old backman has activated a trigger clause, however there has been speculation about his future with Giants defender Caleb Marchbank on his way to the Blues. "It's a funny one with Rowey, two of the last three years he's been in the top 10 in the (best and fairest) and obviously he's been a fantastic player for them," Williams said. "He'll be sticking around and no doubt he'll be hoping he's playing every week. "(Brand) probably would've preferred to play a couple more games this year … but I caught up with (Hawthorn list manager) Graham Wright on Monday this week and had a chat and we're progressing things there. "All things being equal, you'd imagine he'd be at Hawthorn next year." In other news, Adelaide midfielder Cam Ellis-Yolmen could be open to a move during the NAB AFL Trade Period. The 23-year-old, who was taken with pick No.64 in the 2011 draft, could only force his way into the Crows midfield for two senior appearances this year. "They're obviously doing a few things in trade period and Cam is a guy who has got to be playing regular football from now on in," Williams said. "There has been some interest in him, but he's done quite a few hard yards at the Crows over the last four or so years and he's ready to play footy. "He's just got to decide if that's the best place for him." Williams also said ex-Fremantle big man Jack Hannath would assess his options after being delisted having played 20 games for the Dockers.